The winter holiday season means parties with friends, family gatherings, and lots and lots of yummy food! Here’s a simple appetizer that you can throw together in no time flat, the perfect “introduction” to your holiday celebration. 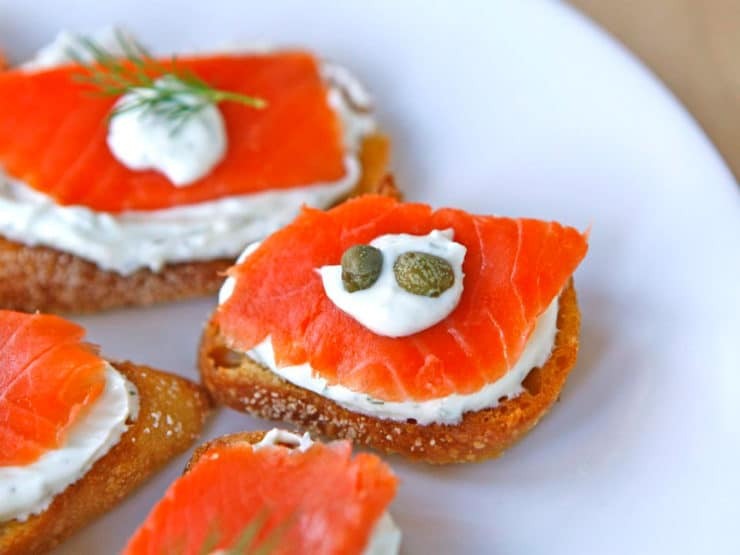 These dainty Smoked Salmon Crostini are inspired by my love of bagels, lox, and cream cheese. 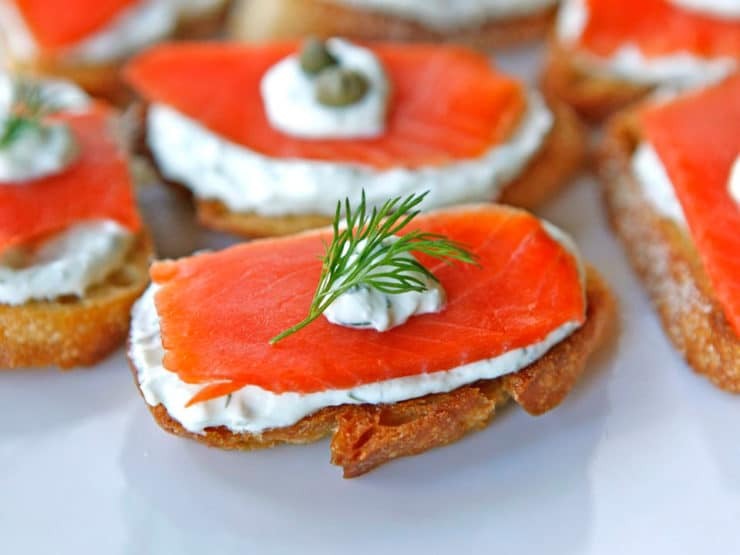 They capture that awesome lox and cream cheese flavor, lightened up with a bit of Greek yogurt, served on crunchy little crostinis… a delectable bite-sized treat. I use smoked salmon here because I love the flavor, but feel free to use brined lox if you prefer. 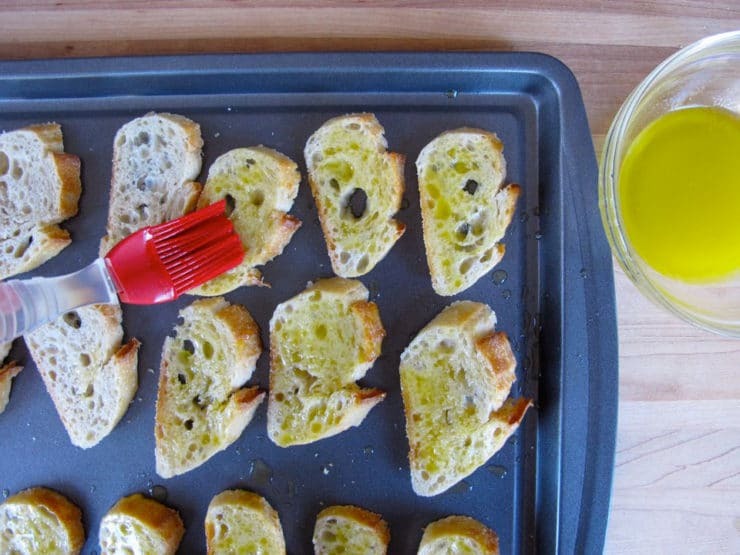 Crostini, which translates to “little toasts” in Italian, are small, thin slices of toasted bread, brushed with olive oil. They originated in Italy during the Middle Ages as a peasant food. Those who could not afford expensive ceramic plates would use bread as a substitute (also known as a trencher). Now they are a popular tapas choice all over the world, likely because they can be topped with anything from cheese and roasted veggies, to honey and seasonal fruit… or, in this case, smoked salmon! I’ve added Greek yogurt to the spread to cut down on fat and calories, while maintaining a creamy flavor. 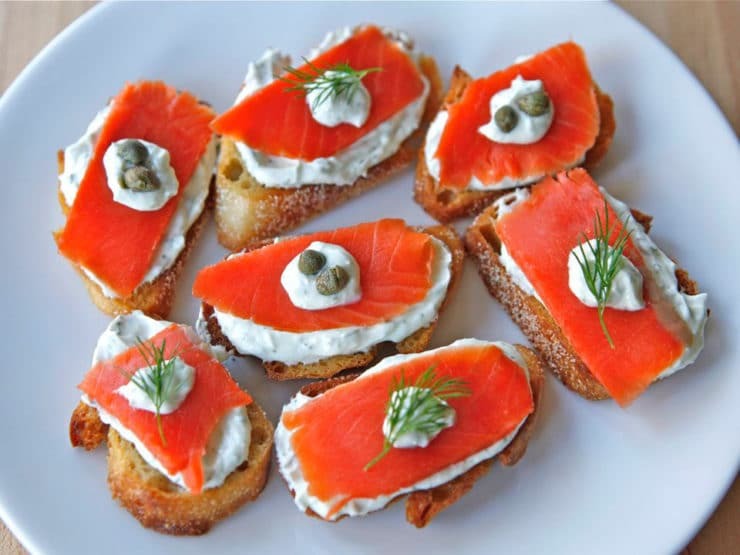 You can top the crostini with fresh dill or capers, or just stick with the smoked salmon to keep things simple. These little treats are packed with flavor, and they’re so easy to make… I can throw together a batch in 20 minutes (even less if I have somebody helping me assemble). These would be a fun opener for a holiday meal or a New Year’s celebration, or anytime you need a quick bite before the “main event.” Love them! Recipe for Smoked Salmon Crostini appetizer with a light Greek yogurt cream cheese spread, fresh dill, and capers. Kosher, Dairy, Holiday. Place the bread into the oven and let it toast for 8-10 minutes till the bottoms of the bread slices are golden brown and toasted. Flip the slices to check for doneness-- they will brown more on the bottom than they will on the top. While baguette slices are toasting, place 1/4 cup Greek yogurt, cream cheese, dill, and lemon juice into a food processor. Process for about 30 seconds, scraping the sides of the processor periodically, till ingredients are well combined. 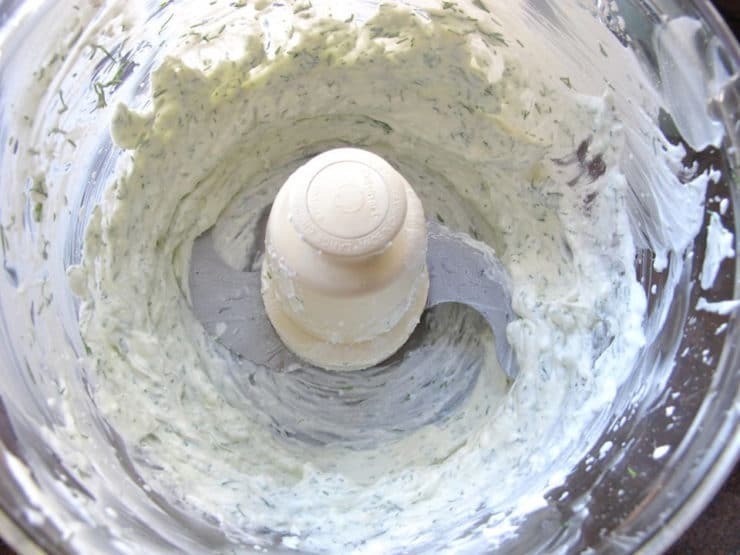 Continue to add Greek yogurt till the mixture is soft and spreadable, but not overly liquid. I usually add about 3/4 cup of Greek yogurt, but the consistencies vary from yogurt brand to yogurt brand, so best to add slowly till the texture is right. Add salt to taste and process again to combine. or a small sprig of dill. 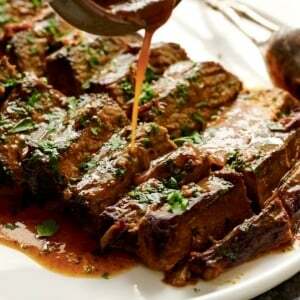 I love this recipe and have made it multiple times for gatherings with friends and family. It is always a hit! I add some Sunny Paris seasoning from Penzey’s Spices for a little extra touch of flavor. 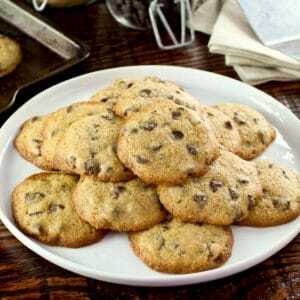 Liked recipe. used much more, in weight, of the Salmon and much less of the spread. Very well received and very easy to prepare and assemble. I will keep this recipe for another day. Instead of Greek yogurt? Thanks! I made this today and my family loved them. I substituted sour cream for the Greek yogurt and it was fantastic. It was so delicious. It was the first thing that was all gone. I made these yesterday for Easter. I made the cream mixture the day before, toasted the crostini about an hour or two before, and then assembled them right before I served them. They are really delicious, and they look really elegant and pretty on a plate! We had 7 adults and I only had two leftover because everyone kept eating htem. The flavor in the cream cheese is subtle but it tastes really good with the salmon. I would just note that I bought 8 oz of salmon (instead of 4 oz) and I used almost all of it. I think that maybe mine was sliced a little thicker or something, but I would have run out if I only got the 4 oz. Great app! I used Neufchâtel instead of cream cheese and I added 2 tablespoons of fresh lemon juice. These were fantastic and a big hit at my party. Hello. This sounds amazing! I was wondering if there are any items in this recipe that can be made ahead of time. For example, could I make the cream cheese spread a few days in advance? What about toasting the bread beforehand? I am hosting a brunch for 30 people and would like to prep as many things as I can the day or two before, as I won’t have much time in the morning before guests arrive. Thanks! Hi Becky! You can certainly make the spread ahead of time and keep refrigerated until ready to use. 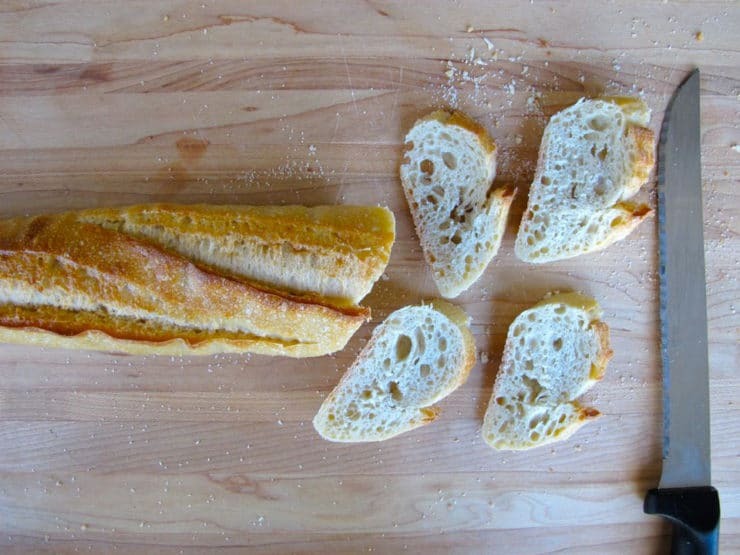 I recommend toasting the baguette slices just before serving, if possible, for a delicate and crisp result/texture. Hi Samuel, definitely make sure you get plain, unflavored Greek yogurt. Any amount of fat content is fine, as long as it’s plain. Plain is the most common variety and should be easy to find. I love this recipe. Have made it before without the Greek yogurt, great addition. Was reading through the comments, though…as far as I know lox and smoked salmon are not the same. 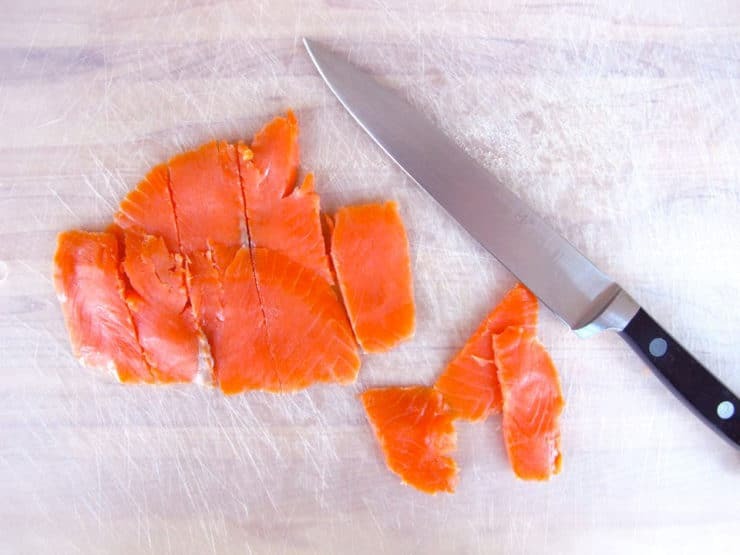 Smoked salmon is cold smoked, lox is cured and not smoked. I prefer the smoked salmon for this appy. Not familiar with Nova Scotia lox. You are correct Deb, they are not the same thing. And I agree that smoked salmon tastes better with this recipe (as I said in the above blog post), though either will work. Glad you’re enjoying the recipe! and the capers on top, too! I could probably eat my weight in smoked lox! I love it!!! Lox is one of my top favorite foods! (y) This looks so tasty! I am going shopping for the ingredients today to make this for brunch tomorrow. put a potato pancake under the lox instead of bread. yum. Yum! I am going to try this one. It’s on my NY’s menu. Can’t wait! absolutely perfect,w e were wondering what to have for newyears. i love ur recipe i used for Xmas brunch last year.. was one of the top favs that day!! making it for a wedding reception this jan 2014 too! Mid sentence I scrolled past this picture and stopped to say “oohhhhhhh”. Yes. THIS is something we used to have every Sabbath morning years back. Great way to start the day. oh yummy! I love LOX! My favorite daily lunch and/or snack! how funny that was such a prevelant comment! Larry: With maybe a tiny bit of caviar to top it off. I’m not a caviar person, Mike.. Thanks for reminding me I have smoked salmon somewhere in my fridge. If I had to choose a “final meal” it would be a nice soft onion bagel, cream cheese with chives, nova scotia lox, a slice of bermuda onion and a slice of tomato. Same here, except I’d choose belly lox, cucumber and no tomato. Last meal, next meal, every meal in between. I’m right there with you Larry! Thank heavens dairy and fish are allowed to be consumed together. YUM! Hi Rita, I would worry that the bread slices might become stale. 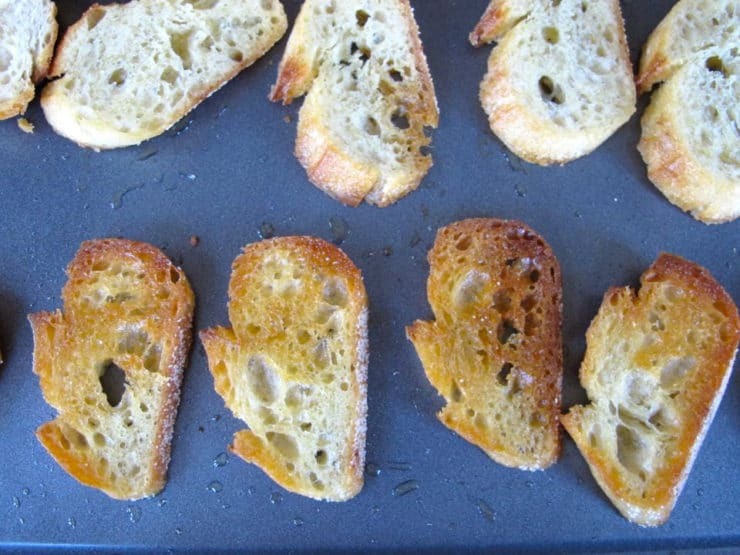 You could try storing them in an airtight container overnight, as long as they are sliced very thin, but know that they won’t have that fresh crostini flavor. The topping can definitely be made ahead, so another alternative might be to buy some crispy crackers and serve the topping that way! I just made these and feel like I might have done something wrong. They were delicious. However the sauce was very runny and ran all over. Not able to put a “dollop” on. Instead had to pretty much pour it on lol. Maybe I mixed it too long in the food processor? Any advice would be appreciated. As i said, it was delicious, just not very pretty due to the runny sauce. 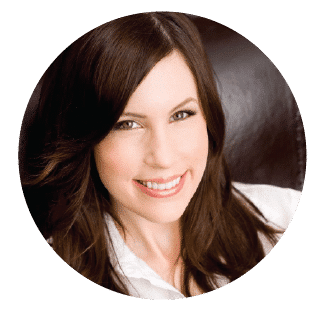 Hi Emily– by chance did you use regular yogurt instead of Greek? Greek yogurt is quite a bit thicker and less watery, which is why I’m thinking the topping might have gone runny on you. Hi Emily, that is strange. Perhaps your Greek yogurt was more liquid than the one I normally use. Next time, try adding 1/4 cup of Greek yogurt to the mix first, then adding more, a little at a time, till the texture is spreadable. I’ll change the recipe to reflect this, so that others don’t face the same issue. Thank you for reporting back! hi there, I made this for my boyfriend and I and we absolutely LOVED it! great recipe! Love hearing that! 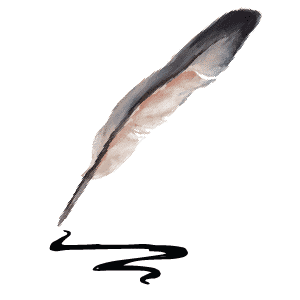 Thanks for writing Jessica! I love the idea of the crostini and the greek yogurt.When I toasted (when I was growing up Bagels always went in the oven to warm) a bagel I always took the bread out of the middle so……….this is so perfect and looks so delicious. I love bagels and lox so I’m sure I’d love this. Thanks for the recipe. I pinned it so I could easily find it when I’m ready to make it myself.